Review: “American Cut – The First 100 Years”, book by Al Gilbertson, G.G. Home > Education > News > Review: “American Cut – The First 100 Years”, book by Al Gilbertson, G.G. Al Gilbertson G.G., in a most enlightening historical work entitled “American Cut – The First 100 Years”, assembles a record of the development of the diamond cutting industry in America from its infancy in the late 19th century. In the process he reveals surprising facts about the role American gemologists and diamond cutters played in the evolution of diamond cutting worldwide. While most members of the diamond trade credit Belgian mathematician Marcel Tolkowsky with determining the scientific parameters for cutting round diamonds for maximum beauty, that work was already in full swing in America several decades before Tolkowsky’s famous work entitled “Diamond Design” was published in 1919. Henry Dutton Morse opened the first American diamond cutting factory in Boston in 1860 and was intent on producing the most beautiful diamonds possible. He had to counter the full momentum of a philosophy brought over by Dutch cutters that was focused almost entirely on retaining maximum weight from the rough. Through Morse’s dauntless efforts, passion and ingenuity, American diamond cutting emerged with a worldwide reputation for supremacy. Innovations that Morse and his brilliant foreman Charles Field contributed to the industry improved diamond cutting all over the world. In a tireless quest for constant improvement, Morse carefully studied proportions and angles and availed himself to the latest scientific knowledge of refraction in diamonds. By the end of his career and before the turn of the 20th century it is clear that Morse’s ideal angles were essentially the same as those prescribed by Tolkowsky decades later. Other jewelers would emerge in the early 1900’s offering diamonds based upon Morse’s parameters, including Tiffany & Co. J.R. Woods and Sons, a high profile American jewelry supply house began cutting diamonds based upon Morse’s teachings marketing them as “Scientific Cut”. Frank Wade was another pioneer who carried forth Morse’s work and was instrumental in teaching the scientific principles of diamond cutting. His influence in the gemological world in the early to mid 20th century was enormous. He embraced Tolkowsky’s work as good science and helped to validate it to the American diamond industry. His collaborative attitude may have propelled the myth that Tolkowsky’s work had given birth to the ideal cut diamond, even though Morse had worked it out many years before. An interesting point that Gilbertson makes is that because of events leading up to World War I, there was little direct contact between cutters in Europe and cutters in America. It is probable that Tolkowsky was not aware of the advances that Morse and other Americans had made at the time he published his work. Eventually, Robert Shipley, a successful American jeweler, would take a deep interest in diamond cut quality. (The story of how that came about is fascinating, but I will leave it for the reader to discover). Shipley went on to establish the GIA and AGS and would revolutionize the diamond market through education and the development of a detailed grading system for polished diamonds. With the same collaborative philosophy that Wade had demonstrated, Shipley brought together a blue ribbon panel of gemologists and scientists in order to propel research and education around diamonds and gems. In the process, his organizations propelled the jewelry industry through the 20th century. Frank Wade was a key member of Shipley’s group of experts. Gilbertson traces the changes that took place in course materials taught by the GIA on diamond cut, and the evolution of terms such as American Cut, Scientific Cut, American Ideal, and other terms used through the years to distinguish different cut parameters and qualities. He reveals the many vagaries and misuses of the terms and the impacts they had on the diamond market itself. The book brings us into the 21st century and new research and grading systems for diamond cut. He explains how the GIA discontinued instruction on cut grading in the 1980’s prompting strong opposition by the AGS. Believing this area of analysis was critical to the consumer in understanding diamond value, AGS would go on to establish their own laboratory in 1996 specializing in cut quality analysis. In turn, the success of AGSL and the growing consumer demand for laboratory cut grading led GIA to begin issuing cut grades on their reports ten years later (2006). What makes Gilbertson’s work so impressive is that he had to piece information together from disparate sources starting from a time when actual data was very hard to come by. In addition, the industry was (and still is) quite opaque and secretive. Through his research and the story that he weaves, he illuminates the accomplishments of several extraordinary American entrepreneurs whose passion for beauty, quality and excellence enabled them to take America the very top of the diamond world. In the process he dispels some myths that even industry veterans will be surprised to learn. 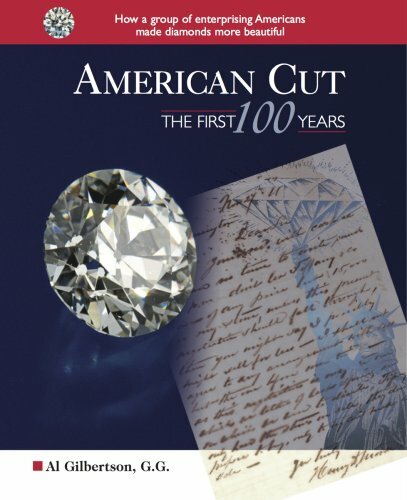 “American Cut – The First 100 Years” is a must read for anyone in the diamond trade. Diamond collectors and enthusiasts will also find this book fascinating, as will history buffs interested in early American ingenuity and industry. A free download of the book can be found here. Al Gilbertson G.G. has a distinguished career in gemology, gem cutting, diamond grading, and diamond light performance research. He is one of a team of researchers at GIA that created the GIA Cut Grading System for the round brilliant diamonds. He is currently studying the influence of proportions and other factors on the appearance for fancy shape diamonds.